Between juggling school, work, and all the other things life has brought my way this year, I think I've done a pretty good job at eating healthy and keeping a steady workout. It's not easy, but it's worth it! When I workout I feel like I have more energy to get things done plus working out always puts me in a great mood. 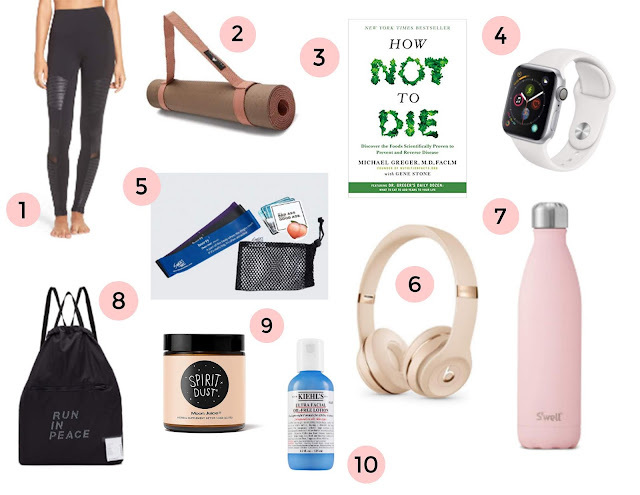 While I was shopping for new workout clothes, I thought I would create a guide for that fitness obsessed friend (we all have one or two) or even for you! You're on someone's Christmas List too, right!? Plus, I think fitness-related gifts are perfect for Christmas because January is just around the corner and the beginning of the year is when everyone is motivated to start working on new fitness-related goals. Some of my essentials for working out are a pretty water bottle, a cute yoga mat, and a cool gym bag. But I've included health books, workout bands, and so much more. So whether your friend is a zen vegan who practices yoga every day, or your friend goes to the gym religiously or maybe your friend suddenly decided to do a "New Year New Me"- I've got you covered! 1. Workout Set- I feel for myself whenever I have a cute workout set to wear, I am always more motivated to go to the gym and workout. I mean who does not love to show off their new cute outfit. 2. Yoga Mat- No matter if you do yoga or not, a yoga mat is a necessary thing for any kind of working out. Whether I am working out at home or going to the gym, I use mine all the time! For any of your work out addicts out there, they most likely already have a yoga mat, but I can bet that they probably need a new one. You could even get them a super cute one that is marble or has their monogram on it. 3. How Not to Die by Michael Gray- $19, I bought this book this year and my knowledge about heath has elevated to the next level! It's a very scientific book, so it might not be everyone's first choice, but this book has so much information about nutrition, diet and mental health and I think that makes this book worth a read! 4. Apple Watch- An apple watch is known for being able to text from your wrist, receiving notifications, and alerts. But what some people don't know is it features that are great for tracking your health. It is the perfect fitness watch and they have even made it waterproof so you don't have to worry about sweating. 5. Sweat With Bec Booty Booty Bands- $25, I own these and they really work! I take them with me when I travel, I just put the three bands in the little pouch that comes with the bands, and throw them in my suitcase, and voila! Gym-on-the-go. Each band has a different resistance so you can have a full body work out if you want. 6. Beats Headphones- I literally can not workout unless I have my music. I take these headphones with me every time I go to the gym and I love them because I don't have to worry about them falling out of my ear when I am working out. They are stable and supper comfortable and literally have the best sound quality out of any other headphones I have ever tried out! You literally feel like you are jamming out to your favorite artist live in concert! 7. Swell Water bottle- I try to drink at least 20oz of water a day. So rather than refilling up a small 12 oz water bottle a couple times a day, I like to catty a large one instead. This one by Swell is so pretty and comes in a variety of colors if pink isn't your color. 8. Gym Bag- I'm really not into gym bags, because honestly most of them are too big or too small or have a brand logo all of them. But this one is so chic and cool! And it's big enough to fit everything you need to take to the gym without looking like a huge duffel bag. 9. Moon Juice Spirt Dust- Anyone who knows me, knows that I love to make smoothies, especially after a workout. If your friends loves a tasty shake or smoothie then this will make a perfect gift for them! 10. Kiels Facial Oil- There is so much goodness in this bottle! It is great to use after sweating at the gym and helps replenish the vitamins and minerals your skin needs.